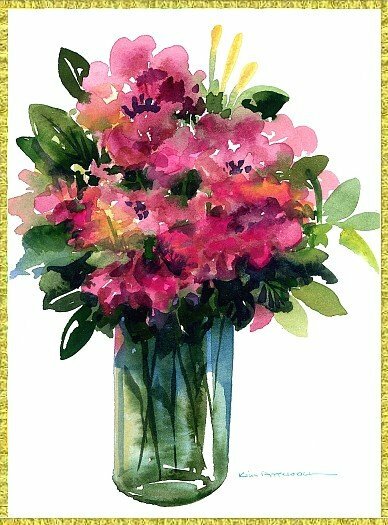 Flower paintings are always popular for greeting cards because they are so versatile that they can be used for so many different occasions...Get Well, Mother's Day, Holiday Greetings to name a few, or just a nice way to send a note to a friend or associate. To see a larger version of the flower paintings, just click on the image then click anywhere to close the image. The size of the image will depend on your screen resolution settings. This image is not suitable for printing, for that, you need to click on one of the "Card" links below the small picture. That will link you to a high resolution file that you can download and print. If you need instructions on how to make the three different types of cards, click here. Flowers are such perfect greetings. This colorful vase of Rhododendrons is sure to delight. It has the look of a spontaneous arrangement, an armful of blooms plopped in a sturdy glass vase. I choose to enhance the sides of the transparent container with eye catching hologram sparkles. Sometimes the blooms are dotted with more color. This happy card should be shared by friends. A doorway is such a welcoming image. 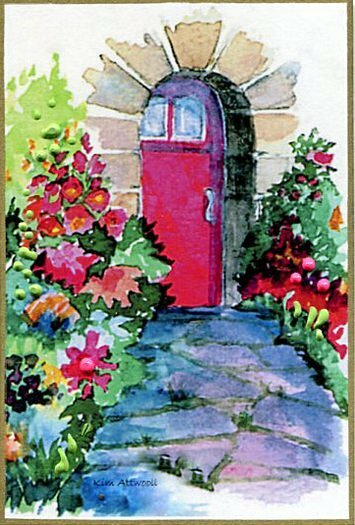 I enjoy painting doors in different colors and flower strewn stone paths. It's a perfect image for "Welcome to your new home". Realtors have sent them to their clients. When people are undergoing change in their lives, send this card to them and write the truism, "When one door closes, another one opens".